Hello Fellow Book lovers and welcome back to my Blog. I first would like to apologize because these past three weeks or more have been heck it, So I haven’t had any blogs up because I haven’t been able to read. Now lets get back to regular schedule programming. This blog will be about the book I, Eliza Hamilton by Susan Holloway Scott, which comes out September 26, 2017 for Purchase. I received this book as an E Arc on Netgalley for review. Now onto my Summary and final thoughts. 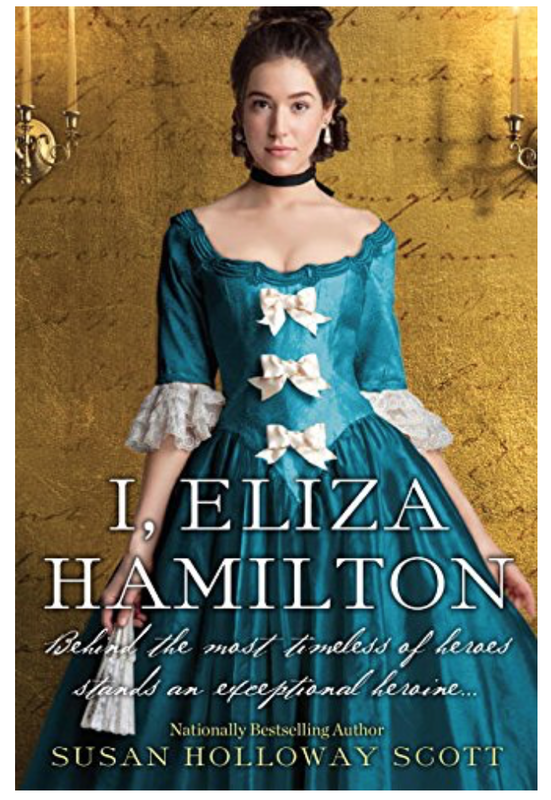 This book is the historical fiction story of Elizabeth Schuyler Hamilton, and how she feel in love with Alexander Hamilton. It describes how they met and when they met. It involves other famous historical figures as well, such as the likes of Mrs Washington and the general. As well as Aaron Burr and people that Alexander met during his years in the army and office, along with Eliza. This story really takes a long look at what Paths Eliza had to walk, in order to be in the position she was and how she handle her relationship with Alex. Its a beautiful story of a brave woman who lead a hard long life because of her Position in this world. Now lets get to my final thoughts on this amazing book. I first would like to say that I rated this book a 4 out of five stars even though its a retelling in a way of Eliza life. The beauty of this book is that Susan was able to mix real historical facts in with a beauiful tribute of a love story. She explored how Eliza handle Alexander promiscuous side of life. How she handle being around people like General Benedict Arnold wife, and still maintain respect as A Schuyler. So many people have been writing stories from Alexander point of view, that it was nice welcome change to see Eliza’s view of their life. I can’t wait to own a physical copy of this book, and I will definitely be buying this book. It really is truly informative on history as well as being a story of a fascinating couple. I also love how Eliza had the attitude of a First lady but wasn’t in the position.I believe that type of attitude is something that had to be real for her, considering she was good friends with lady Martha Washington. This book is just absolutely one of my favorite historical fictions of the year. I recommend you run, not walk but run to bookstore and buy this book on September 26th especially if your a Hamilton fan.I am just so excited for the 26th to be able to have a finish copy in my hands. As always the links for this book, the author will be listed below along with my links.